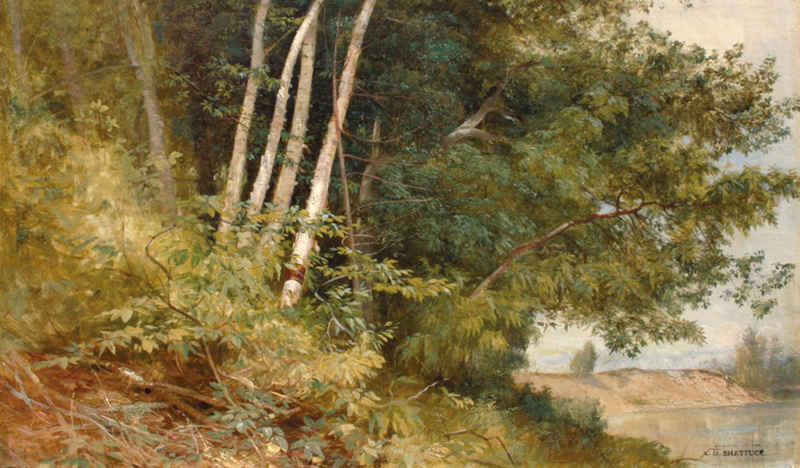 "Described as affable and inventive---he held several patents, including one for metal stretcher keys found on the backs of paintings---Shattuck was also sensitive to his environs, capturing the subtlest nuances of pastoral landscapes in his oils." It's always instructive to me the way the greens are handled. Most of the foliage is shades of yellow, and the green that there is leans toward blue. Then there is the brown which you would expect to see in the dirt, but it is reddish with only some real brown in a few branches. Also the whole picture is keyed high and the lack of dark shadows is interesting for picture in bright sunlight. This is a very thoughtfully painted.